I’m a romance author. I should be all about the weddings. But I’m not. They’re beautiful and memorable, but I’m more of a happily ever after girl. Yes, my own wedding was so romantic—in the courthouse in Arkansas on a Monday afternoon. Twenty-five years later, I have no regrets over my lack of a three hundred person guest list, pristine white dress, and extensive photo album. But there are those out there every day who long for the doves released at sunset, the white stretch limo, and twenty dollar a place setting at the country club. Don’t get me wrong, I’m not casting stones. Everyone should have the wedding (or not) of their dreams. But have you ever wondered where these traditions came from? My current work in progress—The Wildflower Bride— is a follow-up to my latest release, The Gingerbread Bride. And yes, it includes a wedding. In 1871. And so my research began. Which traditions are new? Which are old? Why do brides throw the bouquet? Why do they carry a bouquet? Well, here’s what I found out. In 1840, Queen Victoria married and wore white which started the tradition of the bride wearing white. The white dress was never intended to judge whether or not the bride was a virgin - that was the role of the veil. After Prince Albert died in 1861, a great many brides wore black dresses and a white veil. This was something of a nod to the queen since she started the white wedding dress and then wore nothing but black after his death. A white wedding dress showed a measure of the family’s wealth. A dress of such a delicate material and pristine color couldn’t hold up to stains or work. To have a dress for one occasion was opulence at its finest. married in that dress. It was not uncommon for brides to be married in black or other dark colors, as this best dress could also double as suitable funeral attire. The tradition of bridesmaid dresses and the groom standing to the right of the bride evolved during the time of bridal dowries and bridal capture. A bride with a handsome dowry was sometimes kidnapped on her way to the wedding. She would be forcibly married to her captor, then raped to consummate the marriage. Her father would then have to pay the captor the dowry. The bridesmaid was dressed in the exact same clothes as the bride so as to confuse any potential captors. When it became more difficult to steal the bride on the way to the wedding, a band of men would storm the church and use force to capture the bride during the ceremony. The groom stood on the right of the bride so he could wear a sword on his hip - if someone tried to steal the bride, he could draw his sword and not cut off the bride's head as he defended her. 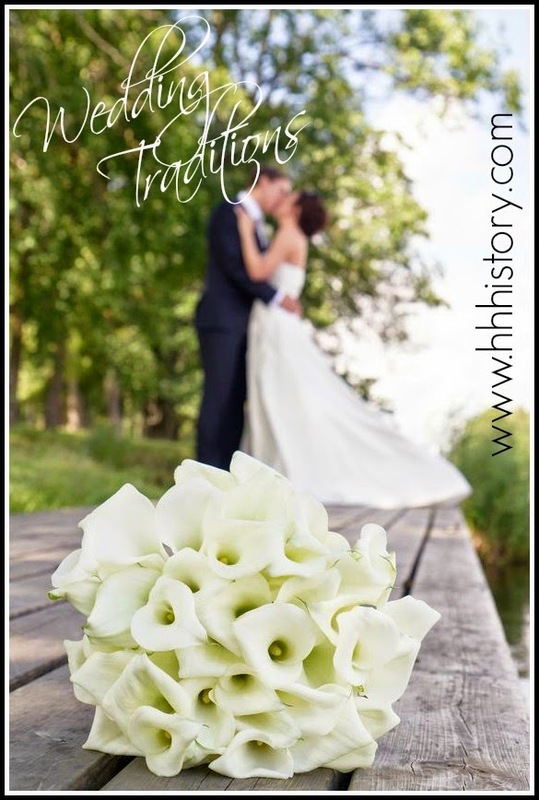 June has been the most popular choice for weddings for centuries. Why? Because during the 1400 and 1500s, people only bathed thoroughly once each year. In May. As such, the overall population smelled relatively fresh in June, making it a good time to hold a special event like a wedding. Body odor was further masked by brides picking flowers and forming a bouquet on the way to the wedding. In 1870, the bouquet was thrown and the couple would go on a honeymoon. In the 1860s, the younger brother of Napoleon, Jerome, came to America and found his bride in Baltimore. He took her to Niagara Falls after their ceremony which caused it to become a popular honeymoon spot. This is the only tradition with a romantic history. In Holland during the 1500 or 1600s, a wealthy man's daughter fell in love with a poor man. The father refused to allow the couple to get married and said if they eloped he would not give the man the daughter's dowry. Without the dowry, the couple had no way of setting up a home together and could not marry. The townsfolk loved this couple so much they showered the couple with gifts and money in order for them to marry. Wedding cakes date back centuries, but the white cakes that we are accustomed to seeing were very expensive up until the 17th century. Only the wealthy families could afford to have a very pure white frosting and this showed the wealth and the social status of the family. When Queen Victoria used white icing on her cake it gained a new title, royal icing. In 1880, wedding photos became the rage, though it was usually just the bride who was photographed. Kissing the bride was also put on hold during the Victorian age. It was considered uncomely PDA. Although I bypassed a lot of traditions, I had a wedding bouquet, something borrowed, and something blue. There was no music, a small cake, and a couple of bottles of champagne. Was there a particular wedding tradition that you observed or didn’t observe at your own wedding? What a touching post. I, too, am a small-wedding gal, married in a friend's home in the company of those who loved us by the pastor who led my husband to the Lord. I made my dress and wore flowers in my hair. The one thing I insisted upon was the cross atop our small cake with two gold rings attached. 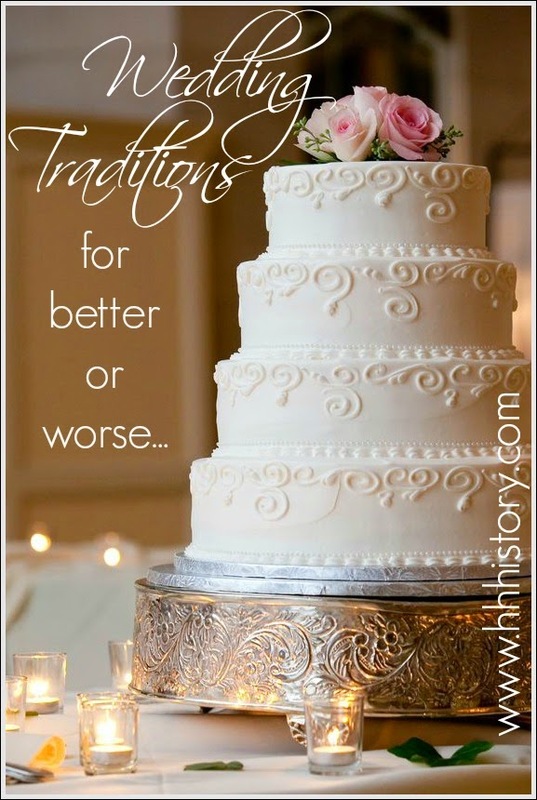 I really enjoyed the wedding traditions blog. Guess I'll avoid any weddings past June. ..If'n they decide to follow the past history. Loved this post! I had a small church wedding...family and a few friends. We just celebrated our 39th anniversary last month! I love weddings! My favorite moment is when the bride first steps into the church. Most people turn to look at her. I don't. I watch the groom's face as he beholds his beloved in her wedding finery. There's nothing like the play of raw emotion across the face of a man who normally doesn't display his feelings. Sigh! The most memorable moment at our wedding was the kiss. Well, not the kiss itself. The prelude to the kiss. Gwynly is a foot taller than I am. His one request for the ceremony was to have me step on a footstool for the kiss. He thought it would be fun. So did I. And it was. When his groomsmen began passing along a wooden footstool specially made for the occasion, our guests didn't know quite what to do. Some laughed. Some applauded. Some stared with gaping mouths. But they all enjoyed that unique touch. Ah, the memories!